We have a special challenge for you this week! I decided to use both the sketch and the inspiration photo. I'm a huge fan of neutrals paired with gold and the pop of green in the inspiration photo is just striking, so I knew I had to pull those things into my design. What do you think of the Mojito flower embossed with gold? Different, but I think I love it. That's the great thing about stamping, you can be creative and try things that you wouldn't normally see in nature. I dressed up my card with the fabulous Pretty Pink Posh sequins in Metallic Gold and a touch of Brown Twine. 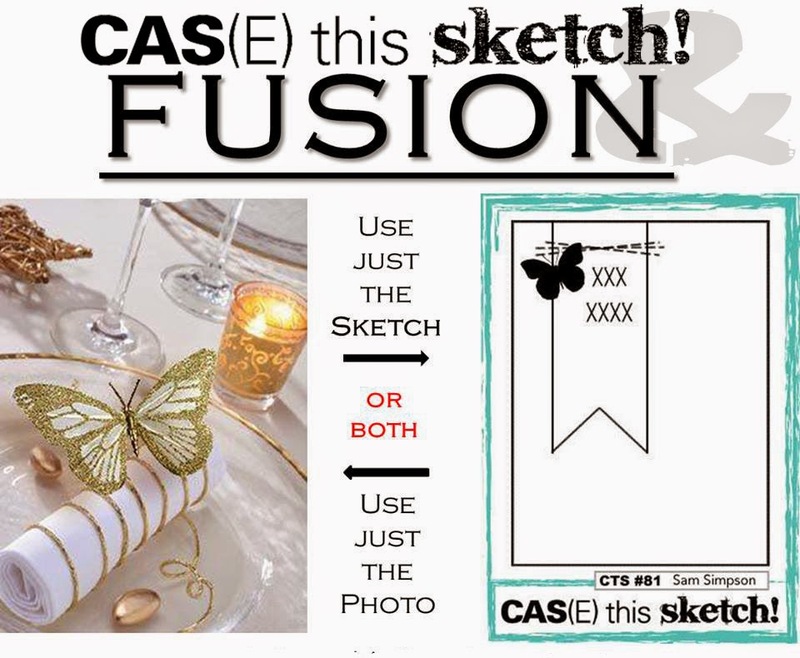 Make sure you check out the CAS(E) this sketch! blog to see how the rest of the team was inspired!!! Then head to Fusion and see what their amazing team did with the challenge. Of course I'm loving those tags!!! Really pretty card Maureen!!! Oh, this is so pretty, Maureen! Perfect take on the inspiration photo & the sketch! Maureen what a beautiful take on the inspiration! Really stunning card, Maureen! I love that you chose Mojito on your flower...it looks so pretty with gold, and your tags are just beautiful! Loving your chevron background, too! Love your off-set tags ... such a gorgeous Fusion Design. Super beautiful card! I can clearly see the inspiration from the photo on your card, so good! Well, I think a mojito flower embossed in gold is absolutely fabulous! I would never have thought to use that combination, but it is absolutely gorgeous! Beautiful beautiful card! I love that you pulled in the bit of green. It really sets off this card. GORGEOUS! 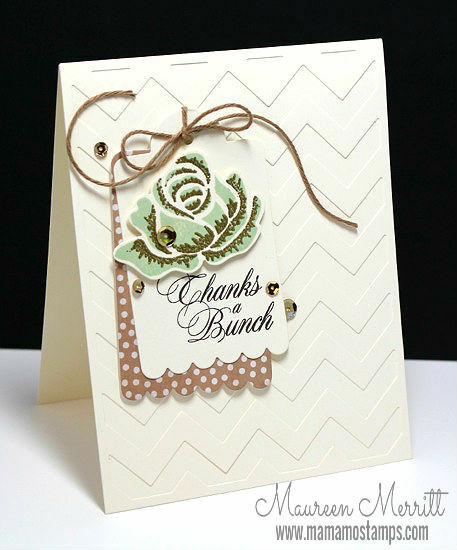 that touch of color is perfect on this card and I am loving all the texture! Thanks for playing at Fusion! Oh adore this Maureen, super pretty! !